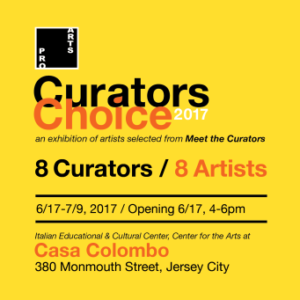 Pro Arts Jersey City, together with the Italian Educational & Cultural Center, Center for the Arts at Casa Colombo, presents the 2017 Curator’s Choice Exhibition. Casa Colombo is located at 380 Monmouth Street in downtown Jersey City. Opening reception is Saturday, June 16 from 4-6pm. The exhibit features 8 artists selected by professional curators from the metropolitan area during a one-day portfolio review. An annual Pro Arts event, Meet the Curator, is a professional development opportunity for local artists. On Saturday, April 8, 2017, at City Hall in Jersey City, Pro Arts Jersey City provided visual artists a chance to discuss their work with leading NJ/NY gallerists and curators in 20 minute, one-on-one review sessions. The reviewers were: Jeanne Brasile, Director Walsh Art Gallery, Seton Hall University; Evonne Davis, Director, Gallery Aferro; Robert Langdon, Curator, Emerge Gallery & Art Space; Katherine Murdock, Assistant Curator, Visual Arts Center of New Jersey; Margaret O’Reilly, Curator and Executive Director, New Jersey State Museum; Stacy Smith, Manager of Publications and Communications, Zimmerli Art Museum at Rutgers University; Anne Trauben, Curator and Exhibitions Director, Victory Hall Drawing Rooms; Midori Yoshimoto, Gallery Director at New Jersey City University. At the conclusion of the portfolio review, reviewers selected eight artists to be presented at the exhibition at Casa Colombo. Midori Yoshimoto then curated the exhibition to suit the space of the gallery at Casa Colombo.